Monday, Tuesday, Thursday — 7:00 a.m.–7:00 p.m.
Wednesday, Friday — 7:00 a.m.–5:00 p.m.
Closed Monday, January 21 for Martin Luther King Day. If you work in the Ridge Lake Business Community, we want to extend the opportunity to you to become a participant at our facilities. Just give us a call at 901-683-7700, or stop by and a Recreation worker will be happy to help you! Pilates improves core strengthening and function with low intensity workouts. Bring your own mat and 6" theraband. This is a donation-based class for anyone with or without experience in Karate. Karate is one of the Martial Arts and is a great way to improve focus while staying fit. Find more info, times, and locations HERE! Employees from the surrounding business park meet in the gym to play 12-minute games of 5 on 5. It is a perfect way to get some time out of the office environment and burn up some energy before heading back into the world. The games are casual. Scores are not kept on record, so there is no pressure. Getting your child involved in recreational sports such as soccer, flag football, basketball, or baseball is one of the BEST ways to make new friends, use up excess energy (that’s for you parents), and get started on a path to a happier, healthier life for the body and mind. If you have a child who is between the ages of 4 & 12 years old, the ESCRA league is a great option to participate in. The emphasis is on getting playing time and experience, therefore there are no league standings or record keeping beyond each game. Although emphasis is on play, if more competition is what you are looking for, there is an upper ability level division that a team can be put in with each age group. Practice times are determined by the coaches of each team and work around the schedules of the participants once rosters are formed. Games will be scheduled through the ESCRA League. Cost includes a uniform. Register for the First Evan Coed Softball team through the City of Germantown and play against teams from Grace Evan, Germantown Baptist, Kirby Woods, Harvest, and more! There will be 9 games plus a double elimination tournament. Games will be played Tuesday nights starting at 6:30 at Houston Levee Park. The fee is $65 and includes a jersey. Email questions to bberry@firstevan.org. Join us each Monday, Tuesday, Wednesday, and Thursday in the gym, 7:30–9:30 a.m and Friday from 8:30–10:30 a.m. Equipment is provided. Open gym is available to kids through 5th grade for play and fellowship time. Please invite friends and neighbors for playdates! Note: Parents or caregivers must remain with children at all times. No child care provided. Who else plays? Grace Evan, Germantown Baptist, Kirby Woods, Harvest, and more! If you want to learn more, email Bryce Berry. If you think you might be ready to use a personal trainer, why not try talking to one to discuss how they can help you reach your goals more quickly and safely than going it alone? Click here to fill out an interest form and Bryce Berry, CSCS (Certified Strength & Conditioning Specialist) will contact you within 24 hours. 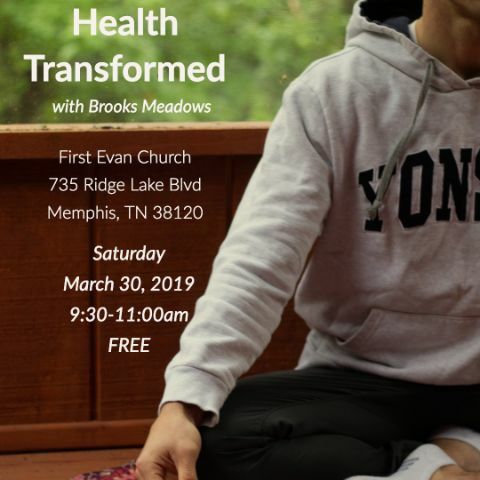 Using interactive methods, Brooks Meadows will show you how to transform your health and training using 3 P's: Process, Practice, and Play. "While I can talk all day long about things I'm passionate about, this workshop is all about having you EXPERIENCE transformation in real-time! I will present the best tools I've learned from the last 14-years of my health journey in one workshop. Prepare to move, breathe, and laugh your way to transformation!" The workshop will take place in the wood-floored Multi-Purpose room in the recreation facility. Turn left when you see the church and we are the last door on the left.